This system of medicine developed in Germany is based on the theory that "like cures like". Remedies selected on the basis of symptoms, help by stimulating the body&apos;s self-healing power. This totally safe medicine has no side effects as it is derived from natural and herbal sources. It helps cure allergic conditions, metabolic disorders, chronic diseases and auto-immune disorders. Whether treating depression, phobias , psychiatric and emotional disorders or promoting self awareness and boosting self-esteem, this helps one understand and resolve difficult thoughts, feelings and situations by talking about them in an unhurried, unbiased and realistic perspective. 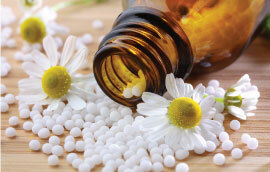 HomeoHomeopathic remedies are safe and natural. All treatments are based on a holistic approach. When the body&apos;s innate ability to cure itself fails to respond to an illness, a homeopathic remedy appropriately chosen will trigger the healing mechanism that is latent in the body. The remedies are totally safe for pregnant mothers and for all ages – from newborn infants right through to the elderly.